Could Aston Villa kerplunk Brentford AND West Ham? Deadline day & match day are here. What is your focus today ? Brentford v Aston Villa in the battle for three points or Brentford v West Ham in the battle for Scott Hogan’s transfer fee. Yes, it’s match day AND transfer deadline day in a bizarre crossing of the streams that can only end badly for everybody. Moreso, with yesterday’s rumour of the day being an apparent bid for Hogan from none other than Villa themselves. That’s not happening, fact. And when I say fact, I mean more opinion. I’ve no inside knowledge but let’s look at the situation a little bit. The Villans are locked firmly in middle table, a mere three points above our own Bees. Despite a brief resurgence when Steve Bruce took over the reins early in the season, they’ve hardly set the world alight. 12 draws (usually 1-1) from their 27 games sees them hard to beat but hardly the sort of team that will have anybody rushing out to watch them. The football I’ve seen has been of a turgid, industrial nature as the draw specialists (they’ve had the most ‘single point’ games in the division), grind their way through the Championship. Given Scott’s avowed intent to be playing Premier League football, any move to Aston Villa would be a bizarre one. A return to that top flight is a long way off and certainly won’t happen this campaign. The very soonest they’ll be scrapping to avoid relegation to the Championship would be August 2018. Is he really going to wait that long when, along with West Ham, Crystal Palace and Watford are amongst those reportedly touting for his signature. I believe those two as much as I believe the Aston Villa rumour but, if there’s even a chance of playing in the top flight why would he tie himself to the Championship? Villa have a wonderful history and a magnificent stadium – nobody can deny that. But they aren’t a Premier League team. Not any more. This smells of Tarkowski all over again. The day we were due to play Burnley, with the club looking to sign him up, he refused to play. I’m not suggesting for one second that Scott will attempt to pull the same stunt (assuming West Ham haven’t stumped up the requisite cash by that point) but is this enough just to put our danger man off his game? Is this enough just to keep him out of the squad as ‘negotiations’ take place? Is this enough to make an agent pick up the phone and comment how the hamstring looked a little stretched at Stamford Bridge on Saturday? In my opinion, and that’s all it is, discount all the other nonsense. It’ll be West Ham or nowhere . I still hope it is nowhere, just so as we can demonstrate we are no longer the sort of club to be bullied in transfer negotiations. Scott will go at some point but let it be on our terms and moreso as, unless the master of surprise Matthew Benham has more than few hidden cards up his sleeve, there can’t surely be any time to bring in new blood. Instead, this is just another game where preparation is disrupted by outside influence. I still can’t get my head around the craziness of the transfer window. Let alone holding a programme of Premier League and Championship fixtures as it ‘slams’ shut(TM). Whilst most people will be looking to see Harry Redknapp eating out of a car window – surely something that he still has an obligation to perform, despite not managing a club since he bailed on doomed QPR two years ago because of a knee problem – in TW8 we’ll be left wondering who will even start tonight and who will be in the squad this time tomorrow. Focus should be on the game. It should be on picking ourselves up and putting in a performance to prove the naysayers wrong after Chelsea.And it wasn’t just me on that front. For a very considered read then Billy Grant’s latest Beesotted column on the subject is well worth a look. Dean has a lot to prove tonight and he has a lot to do to restore some confidence and cheer to the Brentford fans. He can do it, no question. He has the players to do it. But it would be a lot easier if we didn’t have any transfer related distractions hanging around. See you at Griffin Park where, given my prediction skills, Scott will likely be on the opposition bench. Will this be all that happens today? This could be the most crazy 24 hours in modern football. We’ve already had the farce of last night’s Checkatrade trophy opening round where the lure of West Ham and Leicester City U-23 teams (please note, your definition of under 23 may vary) was not enough to persuade supporters to drop the proposed #BteamBoycott in this most maligned of tournaments. And then today sees ‘Transfer Deadline day’ as Brentford supporters join the rest of the footballing community in wondering if any new names will be coming through the ‘in door’ or if anyone is heading out? Jim White, Natalie Sawyer and the rest of the gang lead the madness on Sky Sports before the window eventually ‘slams shut’ (TM) . You all know the drill by now. Yellow ties, yellow dresses and lots of cutting to empty stadia where nothing is happening. Plus, presumably, archive footage of Harry Redknapp leaning out of a car (subject to his sore knee). Another game unbeaten and 10 points out of 12 for Brentford as Bristol City were held 1-1 at Griffin Park on Saturday. A close to capacity crowd witnessed the unadulterated joy of Scott Hogan’s injury time equaliser as the Bees were officially assured of another season in a Championship that will now include relegated Aston Villa. And with Cardiff City, for whom it is is surely a case of ‘win or bust’ as they try to narrow a five point gap to the play offs, visiting on Tuesday there promises to be no let up in the action. The Bees had free scoring Nico Yennaris back in midfield, giving supporters their first chance to see how the team would cope without the mercurial talent of Alan Judge. I think he’d have loved this one as Brentford were given freedom to run at the visitors in a first half where we did everything but score. With the destination of Kitman Bob’s stunning ‘giveaway’ prize hanging in the balance, there was an extra level of frisson to every thrust. And so, not surprisingly, it was pantomime villain Lee Tomlin who ruined the script as he was allowed the freedom of Griffin Park to burst clear and fire home from the edge of the box just before half time. The rotund striker certainly gave it large to the home fans as he celebrated the opener. Having been the victim of non-stop first half comments about his less than svelte figure, there was no surprise in his returning the taunts. Tomlin cupping his ear to the Ealing Road got the reaction one would expect. The second half was a much more even affair. Tomlin was replaced by Peter Odemwingie for the visitors as Bristol City looked to double their lead. To be honest, most of us were just surprised to see the striker on a West London football pitch rather than hanging around in his car outside a West London stadium. Being equally honest, Brentford were lucky not to go 2-0 down when David Button raced out of his box to clear against the onrushing Bobby Reid and came off, what we’ll politely describe as, second best. With an open goal begging , albeit on a tight angle, only a wonderful challenge from Yoann Barbet spared the Bees’ blushes despite desperate shouts for a penalty from the visiting fans. Lasse Vibe, looking to make it 6 goals in 4 games, had the best chance for Brentford. Peter Gilham was already switching on his microphone as the great Dane headed towards goal, only for City ‘keeper Richard O’Donnell to pull off a wonderful point blank save and tip it over for a corner. The best chance that is, until the 87th minute. With the proverbial kitchen sink being chucked at City, substitute Scott Hogan won a penalty after being bodychecked by Nathan Baker. 595 days after that horrific injury at Rotherham, here was a chance for the returning striker to open his account for Brentford. Taking responsibility for the spot kick, he hit it had and low but a little bit too close to the City goalkeeper. The opportunity gone, that was it. Surely? No. There’s a little thing at Griffin Park called ‘Jota time’. Hogan only had to wait a few more minutes, leaping to head home Jake Bidwell’s flick on for the equaliser. It prompted delirium in the stands and a passionate announcement from our own ‘man with the mic’. PG even shunted goal sponsors Siracusa Italian restaurant down the pecking order as he celebrated like the rest of us. There was a time when it looked like Scott might never play again. There have been potentially demoralising set backs when it looked as though fitness was returning. Now, almost two years later, he’d done it. The club have stood by Scott and have now been rewarded. Here’s hoping this was the first of many to come. You could see what it meant to the players, his team mates and the supporters. On day where posters appeared (a good spot, Beesotted) announcing “We’re the first to admit that this season hasn’t gone to plan”, it was wonderful to see something else unexpected – certainly at the start of the campaign – happening. Namely Scott reaching match fitness, starting to get a regular run of appearances and finishing with such confidence. The video highlights have now been released and, of note, they also see the return to action of Mark Burridge in the BeesPlayer commentary box. the regular reader will be aware that our three match winning streak (after that dreadful run of defeats) coincided with his time off at the Atlanta Masters golf. Far from being the jinx some had suggested he might be, what a wonderful moment for Mark to be back at the helm to see Scott get his first Bees’ goal. Welcome back Mr.Burridge. As for those posters. We’ve all got eyes and have seen what is happening this time around. Nobody needs another list of the ‘lows’ whilst many supporters have found it hard after last season’s incredible story of Championship life for the Bees. Whilst that opening comment would be akin to the captain of the Titanic saying that her maiden voyage was blighted with a few teething issues, it was just nice to see the club engaging in a bit of honest comms. Any regular reader will know our constant decent into what Oliver Holt once called “anti-PR” has been a source of regular frustration over not just this season but last time, too. We do loads of great stuff off the pitch (yesterday’s Fan Zone and Bob’s shirt comp being yet further examples). Comms are easy but they take guts sometimes. Fair play for recognising this. “We’re looking forward to moving up the Championship table next year” continued the announcement. Bittersweet news for Alan Judge but how did we miss that? How quickly have Brentford become accustomed to Championship life that a week without a Tuesday night fixture seems like a long one? Bristol City can’t visit soon enough as we’ll have had a whole 7(seven) days since that win at Ipswich Town. It has been a week which has seen us with an awful lot to dwell on and no real news of any substance. Alan Judge is, of course, now out of hospital following surgery on the horrific injury he suffered at Portman Road – from where there has been pretty much radio silence despite the somewhat ‘controversial’ (that’s me being polite) comments made by Mick McCarthy after the game. Maybe something has happened behind the scenes. Let’s hope so. The Judge himself has been putting a brave face on things in public, sharing that emotional message and then a follow up photograph when he left the hospital to return home. Here’s hoping Alan has a quick recovery. Good wishes have been pouring in from supporters all week whilst it sounds as though he’s had a steady stream of visitors since the weekend. Amongst them, Dean Smith and many of the players. Sam Saunders revealed on Twitter that he and Harlee Dean had been to check up on their team mate. Was there genuine regret at the fact that they’d “offered to bed wash him can’t believe he turned it down!“? Dean, meanwhile, used his press conference yesterday to confirm he’d been to see the player at the weekend who was “obviously a bit down”. An immediate reaction of the one described by Dean is only to be expected. It would be a sickening blow for anybody, let alone a player on such form and with the Euro’s beckoning. Would you take a bed wash from this man? On the plus side, if one can be taken from such a situation, there was positive news for Alan when his nomination for the Football League’s Championship player of the year award was announced yesterday. In a final 3 that also includes Fulham’s Ross McCormack and Andre Gray it is due reward for Alan’s wonderful season. Interestingly, Lasse Vibe’s recent hot streak has seen him storming up the blindside and he’s now only two behind the Judge in joint 12th place for the Championship’s overall top scorer. That puts him level with Jordan Rhodes at a fraction of the price. Let’s hope he can move clear against Bristol City on Saturday. Prior to that game, don’t forget that Waterman’s Park hosts the Bees Fan Zone from midday. Featuring a whole host of free activities such as Urban Cage Soccer, Obstacle Challenge and FA Skills sessions (amongst others) there will also be visits from Buzz,Buzzette and some of the First Team Players. This was a cracking event when it took place last season and sounds as though it will be similar this time around. Yet again, it showcases Brentford as a wonderful community club with a whole host of activities laid on for our younger fans. As ever, you can read more about the event on the club site. And finally, issue 3 of Season Ticket holder news letter ‘The Buzz’ hit my email box yesterday. Containing the usual mix of recipes , interviews (Sergi Canos) and Dream XI (Lasse Vibe) it also has ‘Social Club’ – those social media highlights we may have missed. If ever the club were looking for a caption competition…. In the end transfer deadline day ended up being as quiet as a Chelsea FA Cup crowd, with Brentford picking up a solitary signing in Blackburn Rovers left / centre back Jack O’Connell. Whilst there was no sign of the proverbial ‘double swoop’ so favoured by our local journalists, as important was the fact that our squad has remained intact. Perhaps the players taking heed of the warning that had reportedly been ‘fired’ at them by Warbs (is there any other way he delivers one?) not to ‘do a Forshaw’. Thanks for reading and all your comments over the course of the season. For now, I need to make more space on the site for any follow up. However, ‘close season’ will continue in full, further on. Finally – the wait is over. 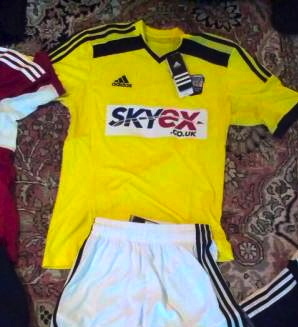 Brentford have unveiled the ‘away’ kit to be worn in our first season back in the Championship. And, in my humble opinion, it’s a classic. Gone is the boring ‘all black’ of seasons gone by and, instead, we have been offered what seems to be a cross between Borussia Dortmund, Colombia and Aston Villa (a) 1985-87. I know a shirt has hit the right spot when Mrs. Bruzon’s initial comment on seeing it, was: “That’s really good; I think I’ll get one of those instead of the home kit”. Even the sponsor doesn’t seem too obtrusive whilst Sam Saunders is sure to be pleased that the yellow colour will match his marigolds. The only real disappointment (and I use the word very loosely) was the lack of a teaser campaign / any build up to the big announcement. Coming from a self-confessed kit nerd, who was desperate to see this, that may sound somewhat hypocritical. However, I’ll also admit I quite enjoyed Mark Devlin’s strip, tease (and that’s not a phrase I ever thought I’d hear myself say) for the home kit. Had it always been the plan to reveal this to the world on Tuesday , given the official launch date is July 27th, or was it the result of leaked images appearing on the GPG? Well, if the latter then it’s a real shame and moreso, because it revealed that Griffin Park’s version of Julian Assange has a terrible taste in carpets. You can see the official photos and story on the club website, here. And for those of you who hadn’t seen the ‘tip off’, this is the picture that ruined it all for those that were enjoying the mystery. And on the subject of away kits, what better time than for a top 5? 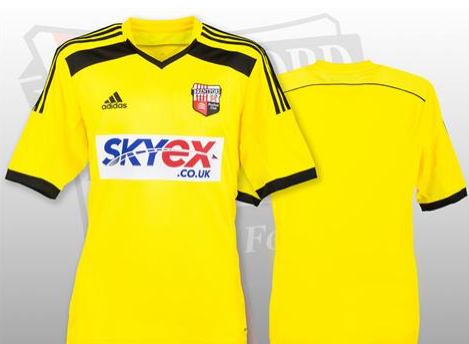 So here are my favourite 5 Brentford away kits. 5: 2011/12 Unveiled in the window of a bathroom showroom and a universally popular effort. Mainly, because the Bees were actually playing in the yellow and black of stripes of, erm, a Bee. Bonus points for being that rare example of a good Puma kit. 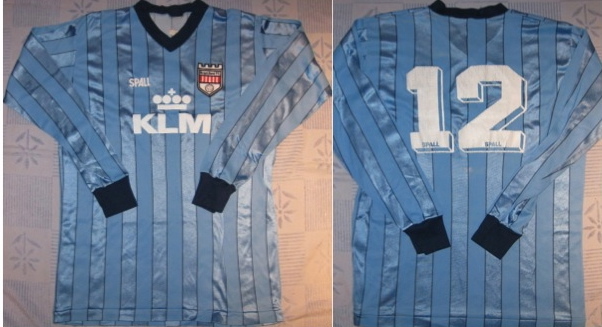 4: 1987/88 For me, ‘traditional’ Brentford away colours are blue and blue. 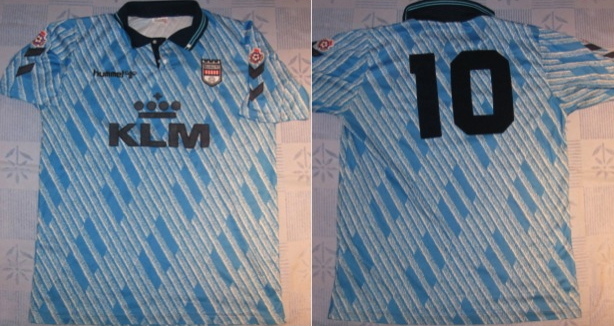 This Spall kit had it all – two tone stripes with matching collar and cuffs (stop sniggering). 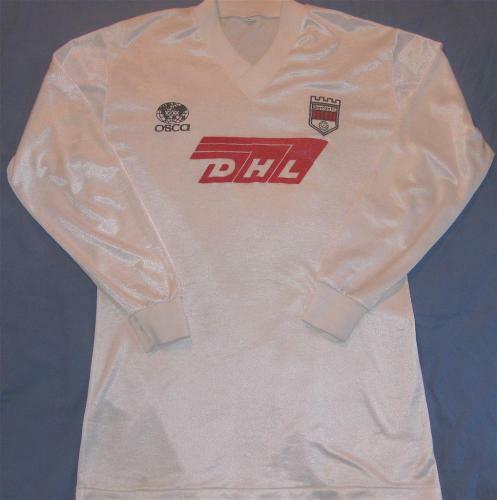 3: 1992-94 As worn in our previous ‘Championship’ campaign and, finally, a recognised name in Hummel after the previous deals with technical sponsors Osca, Hobot and Chad. Migraine inducing design; nostalgia inducing memories. 2: 1983 I don’t even recall ever seeing this in action (live) but this number from Osca is so simple it’s genius. Cracking red sponsor and badge, too. 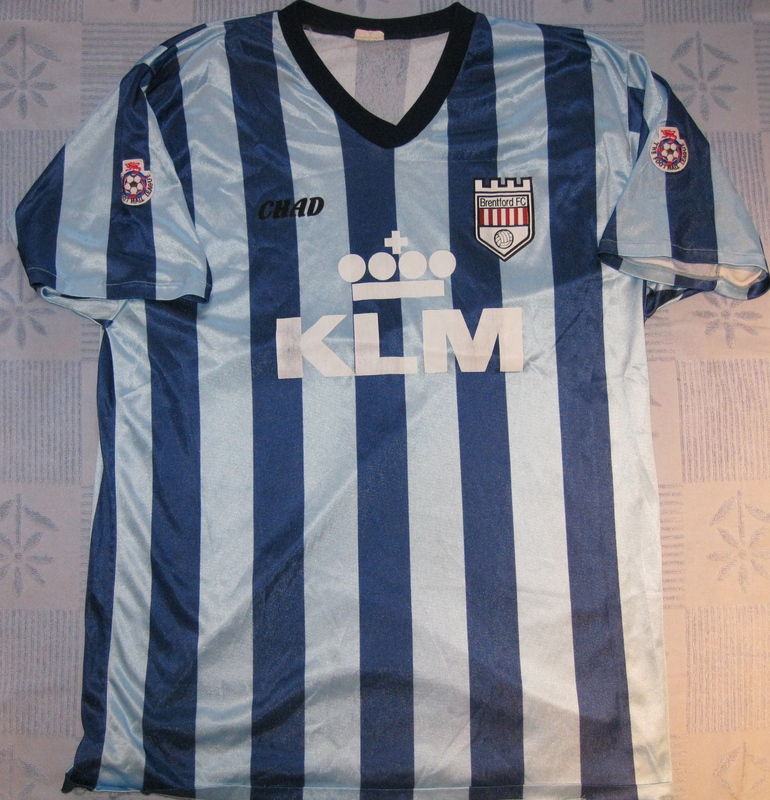 1: 1991-92 As worn in the season that saw promotion to the Championship. 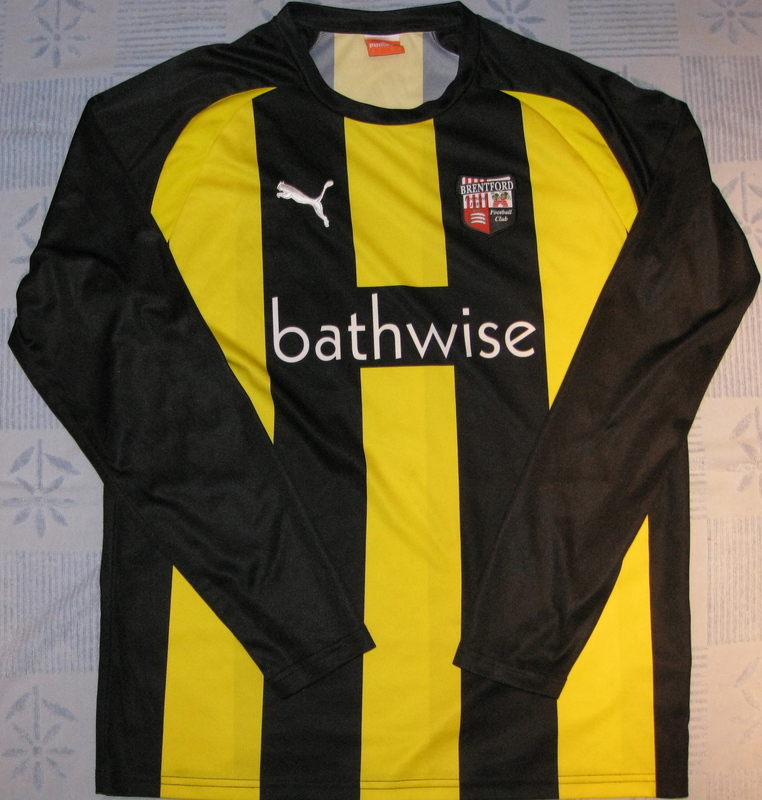 And on the personal side, the first time I wore this replica saw a 1-0 win against Fulham at Craven Cottage. What better omen could you ask for? ‘Celebrating like they’d won the FA Cup…..’ (The story of Brentford’s season 2013/14) – amongst other things – is now available as a digital book. Featuring the best of the not so bad columns from the last ten months, and some new content, you can download it here for your kindle / digital device. For those who still have the image of Sam Saunders wearing not much more than three marigolds seared onto their retinas, here’s a diversion. (Assuming they want a diversion). 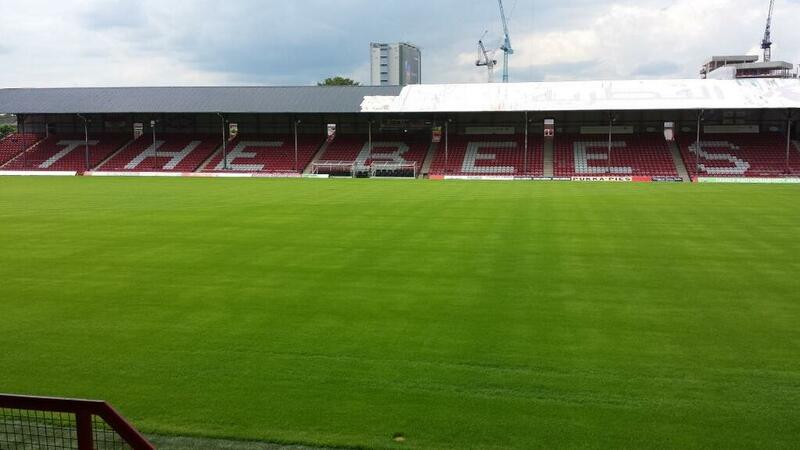 Teams visiting Brentford in the Championship next season will see something different. 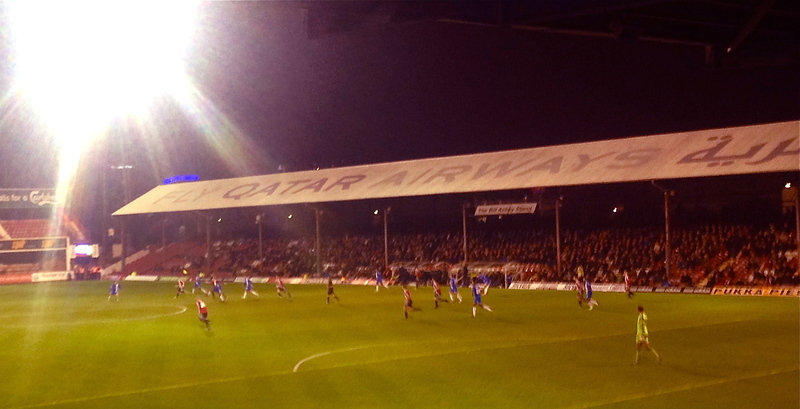 Finally, after years of squatting rent free on the New Road roof, the Qatar Airways advert has been painted over. I’ve long advocated that, if they weren’t prepared to stump up the cash / cover this themselves, the word “Don’t” (or worse) should have been added to the front of this – at a jaunty angle. Thankfully, now, there is no need. Chief Executive Mark Devlin released the following picture yesterday afternoon to show the much-maligned advert had been painted over. Even better news, though, was his subsequent confirmation that this was because of a new sponsor – to be announced once timings have been agreed. After: Who is the mystery new sponsor? Could this be a nostalgic return for KLM? Perhaps another airline? Given the club’s proximity to the Heathrow airport flight path that would make perfect sense. Or have the club joined forces with Skyex for a giant shirt transfer to be stuck over the roof? Either way, given the stadium’s visibility from the air I’d suggest that this announcement needs to be exquisitely timed. Now, if he could just release a picture of the away kit, that would really crank up the excitement levels a notch. Is this how they wash cars in the Championship ? Q: What has three marigolds, two flip flops, a lot of tattoos and a squeegee? A cold day at the car park? Team spirit is clearly alive and well at Griffin Park, judging by the video Sam and Harlee Dean shared of the wing wizard’s unusual car washing technique. This isn’t the first time such clips have reached a wider audience. Harlee had previously made a very cheeky appearance in one of Kev’s Beesplayer interviews. Sam had, of course, released a video of Harlee’s romantic padlock to the good people at Soccer AM. However this takes things to the next level and you can see the full video here. I just hope they aren’t David Button’s gloves. Look out Florida – they’re coming your way. What do you get when you add 92 plus 1? As football challenges go, this one is up there with the best of them. Regular users of ‘Twitter’ may have seen Brentford supporter Simon Cox’s recent postings about ’92 plus 1’. It’s his (and three friends) attempt to drive to each of the 92 league grounds in the top four divisions in a mere 92 hours. Their 2,600 mile journey will start and finish at Wembley, sandwiched between the two World Cup qualifiers on 11th and 15th October. All of this in an effort to raise £10k of sponsorship on behalf of ‘Help for Heroes’. I caught up with Simon in the build up to his challenge, to learn more. Why on earth are you doing this? It’s complete craziness I know, but it’s something we as a team are looking forward to and that I’ve always wanted to do. The visit to all 92 football clubs has been done in 89 hours and 94 hours before, but never sandwiched between two England internationals. More to the point, how on earth will you do this? I’ve done the maths and that’s a distance of 28 miles an hour, every hour, for 92 hours. Forget the maths! We won’t have time to worry about it! It’s simply ‘do or die’ from the challenge point of view. We’ll get in a car and drive. The trick is to keep the vehicle going as long as possible without stopping and we have 100 stops planned. 92 football clubs, 6 fuel stops, 1 Nandos and 1 KFC! Looking at your website, you have got a number of former players involved. Who has put their hands up to help? We have been touched by the support of people in football. It all started with a tweet from Peter Shilton, which has led to former professionals joining us on part of the challenge. Bees Legend Paul Gibbs is joining us at QPR and will follow us across South West London. Micky Hazard (Spurs and Chelsea) has kindly offered to do the North London leg with us, whilst former Leicester City and Cambridge United striker Trevor Benjamin will be joining us between Sunderland and Newcastle. Norwich City legend Daryl Sutch is joining us around Norwich and Wayne Fereday, once the fast man in football I believe, will be joining us on the South Coast. We may have a couple of others to unveil nearer the time. It’s truly amazing that they feel they wanted to help us in some form. Can supporters turn up at the grounds to come and meet you? Yes! We are encouraging football fans to meet us at their local grounds, even if they don’t support that club. Football fans from all clubs live around the world so why not be proud of your club and show your support for our challenge and charity! We would love to complete the challenge with photographs of fans across the UK. This is about uniting together for our forces. What constitutes ‘visiting’ a ground? Is it a case of get out, get a picture and get going? Or do you have any more elaborate plans for certain stadia? For us, this is a challenge against time and time will not allow us to take in a game, have pitch side visits etc. It’s about driving to the grounds, checking in on social media to prove we have arrived and then taking pictures of us there. Will your website be publishing a progress report / details of where & when you will be over the course of the 92 hours? The best place for progress will be our social media places and full directions will be on our www.92plus1.co.uk website. This will contain updates of the challenge, photographs and general football banter! Will pictures of yourself at the grounds be published over the course of the challenge? Oh yes! We want people to see who we are and why we are doing what we are doing. How and when will you sleep (will you sleep)? We will sleep on our travels in the vehicle. It’s not going to be comfortable, but neither is sleeping rough on the front line, which our forces people do to ensure we can sleep comfortably. Tell us a bit about the four of you doing this? We are four football fans uniting for the 92plus1 challenge. Mark is currently serving in the RAF at Brize Norton and is an Aston Villa fan. The minute we received a good luck message from Paul McGrath, he turned into a five year old! Darren is a Liverpool fan who served for 16 years in the RAF before being medically discharged. He enjoys doing charity work and is currently a college lecturer in Norfolk. Mike is a businessman from Milton Keynes and was a former professional footballer at Wycombe Wanderers before he had his career cut short with injury and then there’s me, the lunatic, who runs my own business, but enjoys living every day as if it’s my last. Is there any ground you are looking forward to visiting in particular? Griffin Park, of course! I love the place and it will always be close to me. It’s a proper football ground. Personally, I am looking forward to visiting the various statues outside the grounds, seeing the Hillsborough memorial as I’ve never seen it and sparing a few moments of thoughts for those caught up in that tragic event. I am also looking forward to visiting the smaller clubs like Fleetwood and Morecambe whilst I’ve always bottled the trip to Carlisle so at least I can cross that one off the list! I’ve never been to Old Trafford, Goodison Park or The Stadium of Light so they will be new experiences. I read on Sunday that you may end up having to wear a ‘Fu***m shirt at Griffin Park? You support Brentford – surely this can’t be true -? How and why could this happen? I’ve done some crazy things in my life and this is up there with them. Not the challenge but the shirt thing. I have friends who follow the other “club” and trust me, the shirt was offered very quickly! They know this will hurt but it’s all in a good cause! We have a target of what we would like to raise for our charity and if it means pulling on a Fulham shirt for ten seconds, I will. TV’s ‘Treasure Hunt’ had Kenneth Kendall. 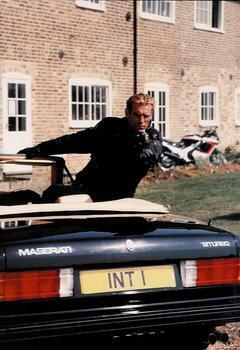 ‘The Interceptor’, Annabelle Croft. Do you have a crack team at ‘home base’ (your control centre, not the DIY superstore) to give you help as the challenge unfolds? Yes we have some fantastic friends and family who will help us and feed us information. To be honest, the break away from the computer will do me the world of good! Saying that, I will be taking my laptop with me. I won’t be able to rest without communication so we will be geared up with communication on board. What will be the toughest part of the journey? I think that will be the long drawn out stretch to Plymouth from Bristol Rovers. The leg of the journey is 126 miles and will see us over the 2,000-mile mark so it’s going to be mentally draining. How can people get involved? There are a number of ways and we appreciate people’s help. They can help on social media by retweeting our tweets, sharing our content on Facebook and helping to follow us on Foursquare. People can also visit our website www.92plus1.co.uk , download our flyer and email to people, promote it on their own social media or generally display the poster in their local pub or chip shop window. Donations are gratefully received and we appreciate all the support we are receiving from our sponsors. There is a link on our page for donations and we are inviting people to donate to our nominated charity for this challenge. What our forces personnel go through in conflict is a concern and what both Mark and Darren have seen in service is the reason why we have opted for Help for Heroes as our charity. How much interest have you had from the media and will we see you promoting this anywhere in the build up / over the course of the trip itself? The media interest has been amazing with local radio stations around the UK interested in covering the story. Phil Parry had us on his show a few months ago and we’re delighted to have received interviews from BBC Radio Gloucester, BBC Radio Sheffield and Heart FM in Wiltshire. There will be more to come! The British Forces Broadcasting Services are currently promoting the challenge across their network as well which means it’s going as far as Cyprus, Germany and the Falkland Islands. If all goes to plan, what time are you due to reach Wembley on October 15th? Presumably you have a car park space sorted? Parking space? What’s that! Yes of course we have one lined up. We are due back at Wembley at 5pm IF everything runs smoothly, but we all know what our roads are like! And how on earth will you sit through an England game? They can be hard enough work at the best of times, let alone after you’ve pushed yourself through this. We won’t be watching the first game if I have my way! There is no way I will be able to sit still for 90 minutes for the first game when we need to go on the challenge. The second one will depend on how we are feeling. 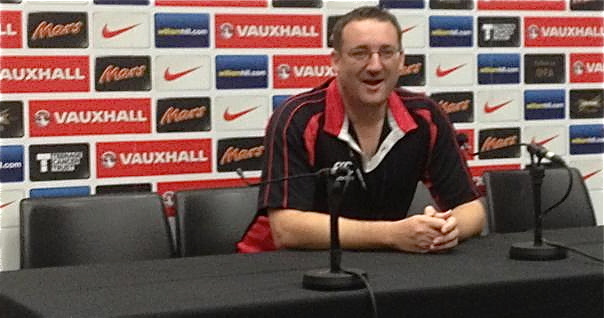 It’s a big challenge and it will be tiring and the last thing I want to do is sleep through a game – the last time I did that was in the 2002 Play Off Final against Stoke City when the beer beat me and I can just about recall the national anthems! Simon – it’s been a pleasure. Good luck. And I hope we can catch up after the event so you can tell us how it’s all gone Thank you for your time Nick. I would be more than happy to catch up with you even if it’s to tell you how I really wore that F***ham shirt……. If you’d like to read more about the challenge and follow the team’s progress, you can link to their website or twitter address of @92plus1. You can also donate here .